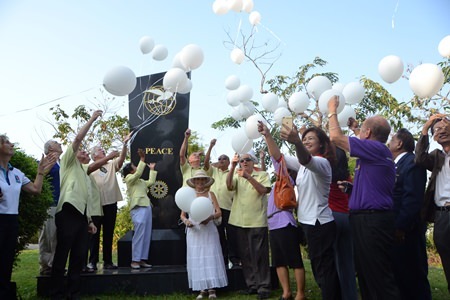 On February 23, Rotarians together with their families and friends assembled at Pratamnak Hill’s Peace Monument to commemorate the milestone. 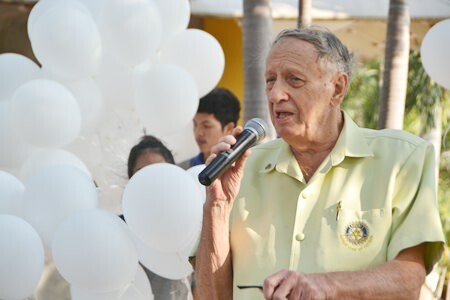 Dr. Olivier Meyer, president elect of the Rotary Club of Pattaya, stated the purpose of the ceremony and invited dignitaries to make their addresses. 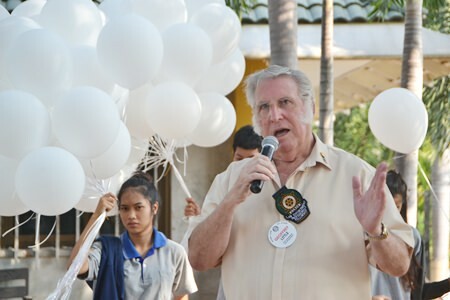 Rotarian Geoffrey Little, Dean of Rotary Peace Ambassadors and member of the Rotary Club of North Sydney Sunrise District 9680 in Australia and one of the original inspirations of establishing Pattaya as a peace city along with many others around the world gave a brief history of the Rotary Peace City and Rotary Peace Symbol Projects saying, “The Rotary Peace City Project and the (then) Rotary Peace Symbol Project were introduced to the 1993 Melbourne World Rotary Convention by Past President Tony Quinlivan. 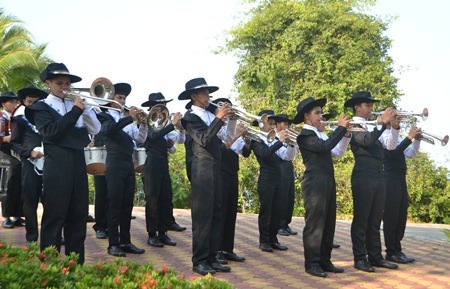 This program originally initiated out of the Rotary Club of Wagga Wagga – Kooringal District 9700 in 1992, where the City of Wagga Wagga, New South Wales, Australia, was the first declared Rotary Peace City in the world. 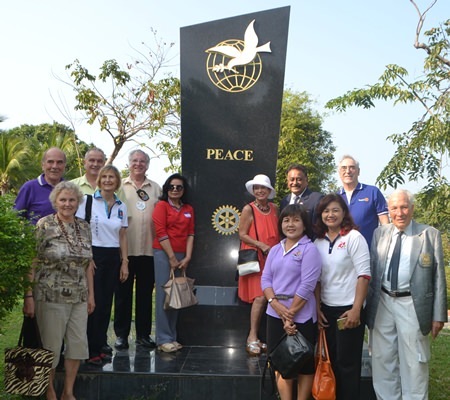 Now there are over sixty Rotary Peace Cities including Pattaya. Geoffrey Little speaks of the history of the Rotary Peace City project. 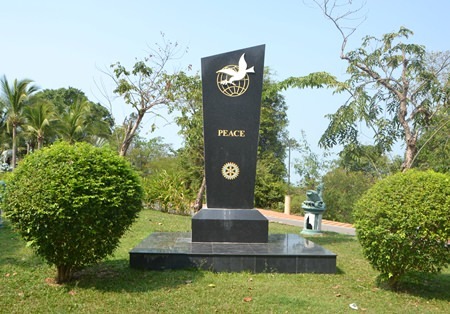 Don Mclachlan gives a brief account of the Pattaya Peace Monument. 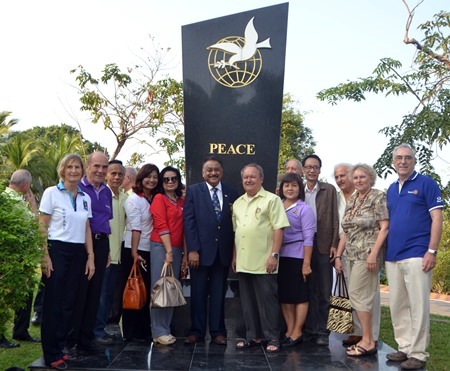 The Peace Monument was dedicated on 23 February 2006, officiated by Rotary Past District Governor Gen. Saiyud Kerdphol along with Pattaya City officials and scores of Pattaya citizens. 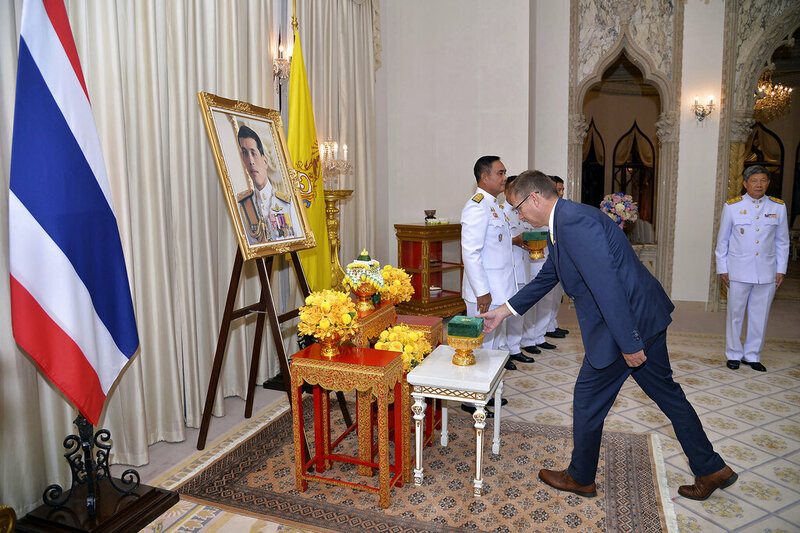 PE Dr. Olivier Meyer delivers the Declaration of Peace. 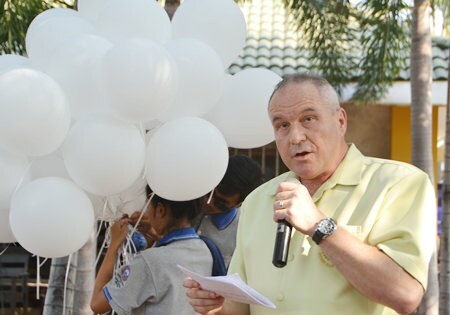 Dr Olivier read Rotary’s Declaration of Peace excerpts of which are, “All human beings have the right to live in a state of peace, free from violence, persecution, inequality, and suffering. As leaders and friends of the Rotary movement, united in service, we publicly declare our commitment to creating a more peaceful world. PDG Peter Malhotra officiated in the PHF awards presentations. “We recognize that a peaceful tomorrow must begin with the actions we take today. We can nurture the seeds of future peace by encouraging young people’s creativity, energy, and idealism, and empowering them to become catalysts for change. It is up to the leaders of today to demonstrate their commitment to peace over war, friendship over enmity, and compromise over conflict, for young people will carry these values forward as the leaders of tomorrow. As each generation inspires and supports the next, the seeds of peace will grow into a green path to peace, constantly moving forward. Rotarians from many Rotary clubs in the area pose for a commemorative photo. “We express our desire for a peaceful world through the action of service. By serving and helping others, we gain empathy and understanding, build lasting bonds of friendship, and empower others to become peacemakers. 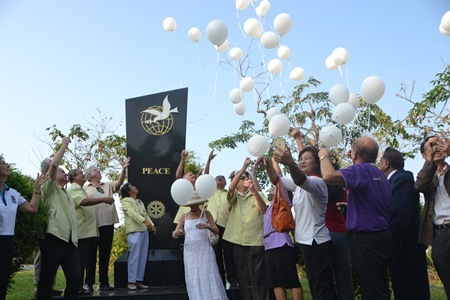 Rotarians and family release hundreds of white balloons in front of the Peace Monument. 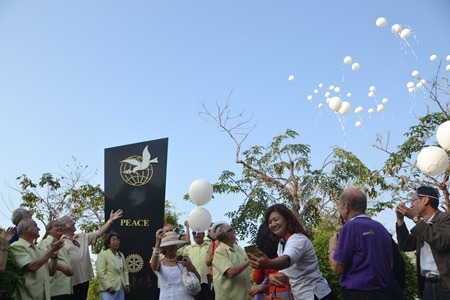 At the end of the ceremonies everyone gathered around the Peace Monument to release hundreds of white ‘peace’ balloons into the clear blue sky heralding a call for world understanding and peace. 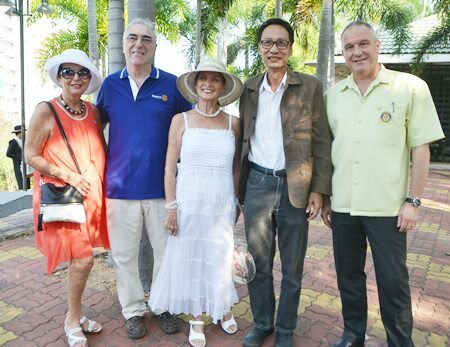 The gathering then adjourned for an evening of fellowship at the promenade in front of the offices of Jural Law and the Pattaya Mail Media Group. 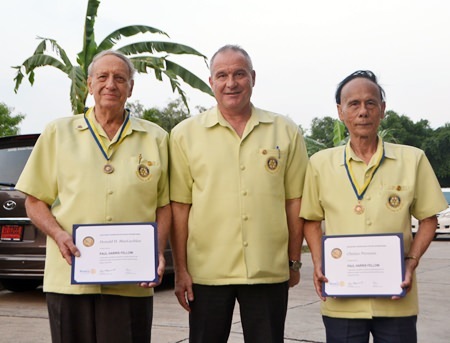 During the evening celebrations another important ceremony took place whereby two members of the Rotary Club of Pattaya were recognised as Paul Harris Fellows. 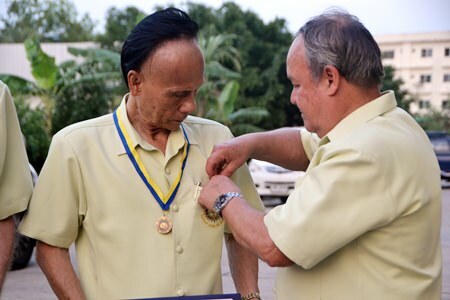 Chalaw Paranan receives the Paul Harris Fellow pin from PDG Premprecha Dibbayawan. 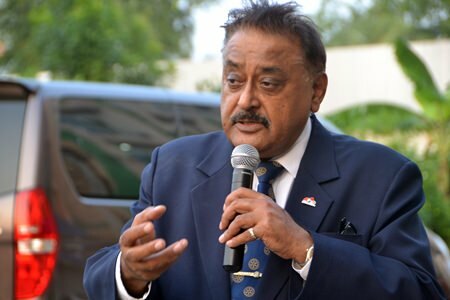 Introducing the recipients, Past District Governor Pratheep ‘Peter’ Malhotra said, “The Rotary Foundation is one of the largest and most important programs of Rotary. 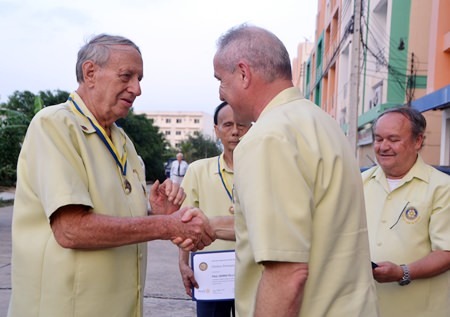 Without the Foundation Rotary could not continue its many humanitarian programs and its efforts to promote world understanding and peace. Don Maclachlan is congratulated by PE Dr. Olivier Meyer on being recognized as a Paul Harris Fellow. 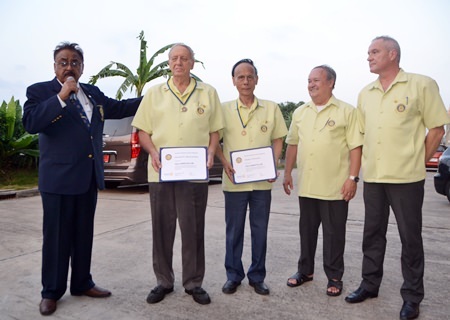 Past District Governor Premprecha Dibbayawan and President Elect Dr. Olivier Meyer presented both Rotarians with their most distinguished Paul Harris Fellow recognitions.